Buy windows for your log home the same as you would for any high quality custom home.The issues are the same. I have come to believe that you should never buy windows as part of a kit.I think the best service and most timely delivery will exist from suppliers close to your home. They can get your windows and hold them for you until you are ready for them, and if there is a problem, they will be able to help you much more easily.You are likely to be building a home that will last a very long time, your dream home. 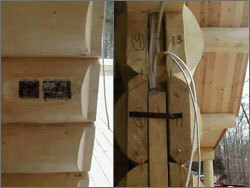 Our handcrafted log wall openings come fully prepared for window installation. The log ends in each opening are cut to size, face flattened beside the opeing to receive trim, and with precut keyways and keys provided. The window is hung into a site-built window buck usually of 2 x 10 material. The 2 x 10 buck is attached to our ready-made key and keyway. The total amount of glass that you decide to use will have be the topic of another discussion as it is a complex issue of its own, tied specifically to your design and location. Shop for prices and styles first to get a feel for the cost and the range of styles available and to help you while your design your home. Then you should complete your preliminary design and compile a list of the sizes and requirements from your plan for serious shopping. 1.Wood or metal? And if wood, clad or not clad? In general, log home owners prefer wooden windows over metal windows.Although not a hardfast rule, often all-wood double glass windows are the bottom of a manufacturer's line.Some people have no problem with Metal or vinyl windows.If so, all the same rules and caveats apply.There are some very good quality metal or vinyl windows available.There are even vinyl and metal windows available with interior finishes in hardwood grains. Most log homes are finished with semi-transparent sealers, not paint.If you buy all-wood windows, and plan to stain them to match the exterior of the logs, be sure that the all-wood window is NOT prime painted.If the window is primed with paint, you will have to either remove the primer before staining, or paint the window.Check to be sure that whatever preservative finish, if any, is applied to the window at the factory will absorb and hold penetrating stain/sealants like the logs do. I prefer the best of both worlds-wooden windows with metal clad exteriors for the longevity and ease of maintenance they offer.As long as the cladding is in a color which harmonizes with the exterior, the clad windows will look great and STAY looking great long after the all wood window finish fails.Some manufacturers offer clad wood (and some all wood) windows with your choice of many different factory applied custom colors in addition to the standard offerings. Custom colors usually entail greater cost and lead times. The interior of wood clad windows, of course, is not clad, and can be finished to your wishes, usually with the same clear interior finish used on your logs. Interior stain for the window sashes and frames are optional, depending on your tastes and the color of your log walls. It is important to get at least Low E double glass in virtually all US climates. Low E (emission) refers to the ability of glass to transmit less energy, in either direction because of thin reflective surfaces applied to the one side of the glass. Modern high efficiency glazing has R-values greater than R3. They can go higher and not all R ratings are the same. Low E window glasses from different manufacturers have different performance ratings. Low E glass offers another important benefit by greatly reducing UV radiation inside your home, allowing your furnishings last much longer without fading and degradation. There are many factors in the construction of a piece of Low E double glass such as the spacer bar construction, choice of sealants, the depth of the space between the glasses, and what is contained in the space between the glass. Many of the better glazing systems fill the space between the glass with argon gas instead of air because it is a better insulator than oxygen. There are even better systems available, such as Heat Mirror™ technologies which use Mylar sheets suspended between two sheets of glass to give the effect of triple or quadruple glazing with R-values as high or higher than R 5. Be aware that windows can be rated for R-value in different ways. One of them is the R-value at the center of the glass, the other is the average of the whole unit. They are called respectively "Center of Glass R-value", and "Total Unit R-value". The best data uses both. Look for "Center of Glass" R values at or above R 3.5 and "Total Unit" values at or above R 2.5. Do not trust claims of Unit Values in excess of R-5, as only a very few top quality manufacturers claim values that high even for fixed glass. Furthermore, R-values of glass are the same for most sizes within the same product line and glass type while R-values for Total Unit are higher for large units than for smaller units from the same product line. If you have a large amount of glass (more than an area equal to 8-10% of your floor space), or are in a relatively more severe climate, hot or cold, get the highest possible R-values. For the most extreme weather conditions, consider buying a line of windows that offers factory storm units. Don't skimp here! Tempered glass will be required for safety in certain bathroom windows and tall windows or glass doors near floor level. Tempered glass should be furnished by the manufacturer standard in all sliding and swinging patio doors and deadlights. Windows can leak a lot of air if they are of poor quality, or if they are poorly installed. Windows are rated for leakage with a simple volume measurement, such as ".03 CFM/Ft, (about three-hundredths cubic foot of air per minute per foot of sash). Generally speaking, casement and awning casement windows leak as little as one third as much as doublehung windows do. Even fixed windows such as picture windows and circle tops have leakage ratings. Check the specs. Look for CFM/Ft rates of less than .05 CFM/Ft for casements, less than .15 CFM/Ft. for doublehungs, sliders and patio doors. This is a large factor in the tightness of your home. Another spec to check is the NWWDA class of window. It relates to the ability of a window to resist wind driven rain. This rating is important in high rise buildings especially, where wind driven rain is a real problem. Minimum ratings for residential structures start at DP15. Focus on the air leakage and R-value ratings instead. There is considerable variation in the style and quality of the woodwork on the inside of your windows. Many manufacturers are using things like blind mortises to hide joints, veneered clear stain grade faces over laminated sash for greater stability and consistency (and to avoid the high cost of increasingly unavailable ponderosa and white pine,) recessed locks, and other features. Let your eyes do the walking. . . . . . and your fingers too! Look for smooth joinery, exposed end grain should be smooth. The wood should be preservative treated from the factory. The glass should be well sealed, often evidenced by sealant showing at the edge of the sash, (this is a good thing, not simply slop! The various seals and gaskets should fit snugly and be neatly trimmed at the proper sizes. Not much to talk about here, things like recessed locks are basically cosmetic features. The hardware should be heavily enameled or plated with brass or chrome and should operate smoothly. Large windows should probably have 2 locks. Tall casements also do better with two locks per sash. For swinging patio doors, many manufacturers now offer very high quality three point locking hardware which makes the door more secure and energy efficient. Unless you are buying the (usually) extra cost three-point locking hardware with your swinging patio and french doors, I recommend buying the passage locks and deadbolts when you buy the rest of the door hardware for your home, so all the door lock-sets match and can be keyed to your specs. However, for sliding patio doors, DO include the locking hardware and foot-bolt with your doors. This is a good time to consider a good full service home center, as they are both near you and proficient in this type of product/hardware co-ordinating. 6. Availability and cost of Custom shapes. If your design calls for custom windows of any shape, it is important to know that you can get it. Knowing what the time frame is likely to be is very important to your construction schedule. Compare the costs very carefully as well. Some companies' custom windows are only slightly more expensive than stock sizes, and some are a lot more expensive for customs. Also, some companies have a larger number of shapes that are standard, lessening the likelihood that you need to order a custom window. Another pricing factor to be aware of is the cost of tempered glass as it can vary widely. Few window manufacturers sell deep enough extension jambs to fit logwalls, and when they do, most extension jambs are shipped loose. Here again prices and availability vary widely. With respect to extension jambs, I personally recommend that the jambs be extended with material ripped at the site to match the interior trim-stock, especially if they would be shipped loose by the manufacturer anyway. . . .
Talk about all over the map! Window warranties can be for as little as one year for the glass seals, to as much as ten years full coverage with lifetime prorated! As with all warranties understand the whole thing before you judge! pro-rating, the practice of covering less of the value of the window each year, can basically make the warranty worthless after a few years. Often different parts of the window such as the glass, hardware, seals, etc. carry different lengths of warranty. Some of the best warranties come with competitively priced, well-known window brands. Buy your windows based on the locality of the seller (close to you,) features, warranty, brand and price. Windows are typically sold at discounts from suggested retail ranging from 10% to 30%. Often a discount is given for the window but not for any accessory such as factory storms, or screens and grilles. You need to know! With the advent of the large discount building supply centers, many of the smaller lumber yards are leaving the industry. Therefore, from the perspective of warranty service, the manufacturer and local supplier that you select are important. Copyright 2019 BigLog Homes. All Rights Reserved.